(Last Updated : 29.06.17). Himachal Pradesh PSC PGT Screening Test Result & Interview Admit Card 2017 : Download HPPSC PGT Result 2017 Interview Schedule of Screening Test Dec. 2016. Himachal Pradesh Public Service Commission (HPPSC) declared final result of PGT Physics & Chemistry. Before this, the Commission declared written test result of PGT Political Science, History, Biology, Economics, Hindi & Sanskrit Screening Test 2016 held in December 2016 against Advt. No. 10/2016 for recruitment of 394 PGT posts. HPPSC conducted written test for recruitment of Post Graduate Teacher, Class-III (Non-Gazetted) (on contract basis) in the Department of Higher Education, Himachal Pradesh through official website i.e. www.hppsc.hp.gov.in. 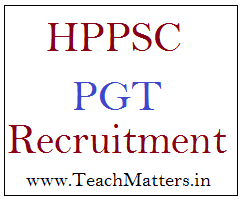 Candidates who have appeared in written exam for these posts of PGT can download PGT Screening Test Result, Interview Admit Card, Exam Scheme, Syllabus, Vacancy Details, Question Papers & Answer keys of HP PSC PGT Recruitment 2016-17. HPPSC released written examination/screening test result for various posts of PGT. HPPSC PGT Screening Test 2016 was held in December, 2016. Written test result and Interview Schedule for various subjects has been declared by the commission on their official website and candidates can download written test result here. HPPSC conducted written examination / screening test for the post of PGT as HPPSC PGT Screening Test 2016 in December, 2016. Exact dates and time schedule of written test was released on 22.11.2016 by the commission on their official website and candidates can download written test dates here. Eligible candidates can download their admit card for PGT screening exam 2016. Candidates want to appear in this written test can download their admit card as per the schedule uploaded by HPPSC. You can download your admit card now as HPPSC uploaded the admit cards on the official website. The commission advertised recruitment notification for the post of PGT against advt. no. 10/2016 on 27.07.2016. Candidates can apply up to 16.08.2016. Here is the detail. (i) Bachelor of Education (B. Ed.) as professional qualification from recognized University/ Institutions with minimum 50% marks. OR Two years integrated M.Sc. Ed. Course or an equivalent course from a recognized University. For more information regarding age-limit, reservation criteria, fee details, syllabus, exam pattern etc. download detailed advertisement or visit official website.